Jackie Johnson was the drama teacher at UH Hilo for over 38 years. 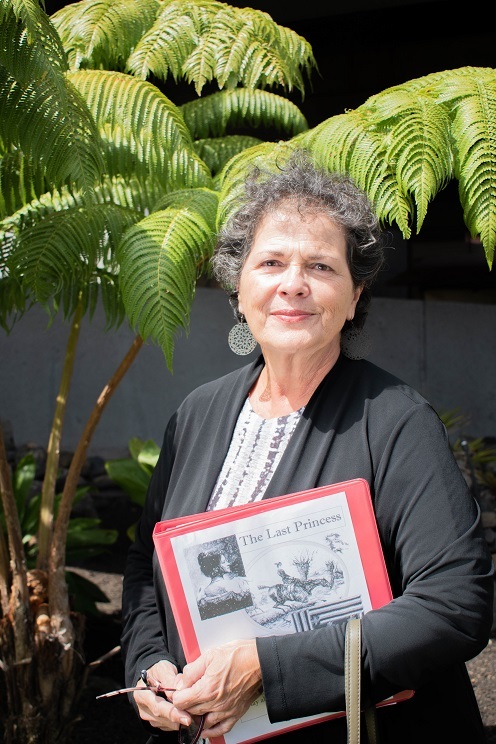 In an interview with Ke Kalahea, she talks about the upcoming play she’s working on written by Jackie Prell, owner of local business Sweet Cane Café, about Princess Ka`iulani, the last Crown Princess of Hawai`i. She talks about how the collaboration came about, the importance of telling Hawaiian history, and gives insight into the creative choices she made. The play opens April 5 at the East Hawai`i Cultural Center, and features UH Hilo students. The following is an abridged interview. This is a historical play. What is the setting and background of your play? JJ: Princess Ka`iulani was in the royal line; her aunty was Lili`uokalani, and Kalākaua was her uncle. She would have been next on the throne. She was sent away to England to receive an education when the overthrow happened. She went to the president of the United States, Cleveland, to convince him of her cause. He agreed, but when President McKinley came into office, he had a whole different attitude. He pardoned the sugar plantation barons, but we all know the truth, which is that the United States was complicit in the annexation of Hawai`i. The money involved was extraordinary. So these are the underpinnings of the play, but the play is through Ka`iulani’s eyes, and her inner turmoil – what will happen if she comes back? How can she help? How did you decide to direct a play that covers this subject matter? JJ: A few years ago, Jackie Purell brought the script to me. At first, it was written as a movie. It was beautiful, so we tried to get it off the ground as a screenplay, but making a movie is a whole other cost factor. A year later, I asked her if she would still like to see it come to life as a play. So she handed me a theater version. [laughs] It’s written in a very modern, episodic way. In some ways, you still get the underpinnings of a movie, but we’re used to that because of the TV and movie mediums. There’s an editing sensibility in that. Some of the ideas that can be treated in a deft fashion, quickly, are done so, but then those have more substance for longer scenes. So it really moves. Jackie did a beautiful job of shaping the story. Well, I’ve been involved with the [Hilo Community] Players, ever since sophomore year of high school. I thought that I would be able to do more with them here, but I waited a little while. Then I realized, coming back with a Hawaiian play would be very meaningful to me since I do Hawaiian Living History. Is there an audience you think the messages in the play will be especially resonant for? JJ: It’s written in a way that it can be accessed by both adult audiences and younger audiences. Sometimes things are geared to the younger audience for understandability, but there’s also [a scene with] a gun to the throat of a palace guard, and those things are there. They were a part of history. It might be seen as adult fare, but that’s the truth of what the overthrow was about. Can you tell us about the themes in the play? JJ: A lot of the play is about the clash of civilizations. Even though Hawaiian civilization was very westernized at that point, lot of cultural artifacts had not been tossed out. There’s one scene where hula dancers come in and they say “This is obscene. You can almost see their bodies.” That was the sentiment because of puritanical views, and it butted heads directly with Hawaiian culture. In fact, much of Hawai`i was religious, and royalty followed the Christian values of the time. Because of that, Lili`uokalani expected that the United States would give the country back and act in a “Christian manner.” What Hawaiians were taught through Christian values were not carried through in terms of an overthrow. These seem like very grave events. Do you see the play as a tragedy? JJ: While the play isn’t without humor, it is a tragedy. I think it’s also inspiring as well. Ka`iulani’s courage and determination in her short life was very tangible.